To allow a user configurable decay mode, we turned on synchronous rectification by default in the Stepper Brick firmware. With synchronous rectification enabled, efficiency is improved by replacing diodes with actively-controlled MOSFETS and mixed decay modes are made possible. Without synchronous rectification only fast decay can be used. After we replaced a defective Stepper Brick of a customer and the replacement self-destructed too, we had to investigate. Turns out it is a bad idea to use synchronous rectification for big stepper motors with high inductance. We managed to reproducibly destroy Stepper Bricks with a 3A Nanotec stepper motor at speeds above 40000 steps/s while it works without problems when synchronous rectification is disabled. Granted, the stepper motor we used there is a bit above the specification of the Stepper Brick. To be on the safe side in the future we added a possibility to enable and disable the synchronous rectification and disabled it by default in the newest Stepper Brick firmware: http://download.tinkerforge.com/firmwares/bricks/stepper/. If you have a stepper motor that is at the maximum of the Stepper Brick specification and you want to use it at high speeds, we highly recommend to keep synchronous rectification disabled. Circuit boards and parts for the LCD 20x4 and Humidity Bricklet are now complete. The whole thing will go in production on friday. So far everything worked as planned. The number of preorders is so high currently that it will probably take up to wednesday until everything is shipped (May 1st is a holiday in Germany). In the last weeks the complaints regarding our payment provider (Moneybookers) seemed to increase. Many credit card and ELV payments were not accepted without any reason and often the shopping cart was empty after the abortion. Even after a long back and forth with Moneybookers these problems couldn’t be fixed. Thus we decided to change the payment provider about a month ago. All of the necessary verification processes are now completed and it is from now on possible to pay with credit card or with ELV (Germany only) over Heidelpay. In contrast to Moneybookers the whole payment process is now integrated in our shop. There are no popups any more, you don’t have to leave the shop for payment and the shopping cart will still be there if the payment failed! Additionally to credit card and ELV it is still possible to pay via prepayment (europe only) and PayPal. Regular customers, universities and schools can still order on account. With Heidelpay it would also be possible to integrate the PayPal payment process into our shop (so you aren’t redirected to the PayPal site for payment). This would cost us a little bit more but if it is asked for we could activate that pretty fast now. We did test the new system with some real orders and everything seemed to work fine. If you have any problems please contact info@tinkerforge.com so we can fix the issues! Edit: Unfortunately the new NC7WB66K8X with the same date code have the same problem. The only other solution that we found to circumvent the problem is to put a small capacitor directly in front of the supply voltage of the analog switch. There are of course no pads there, but we found a hack to fix it nevertheless: Fortunately there is a big VCC trace directly at the pad of the NC7WB66K8X and directly below the trace is a big GND plane. 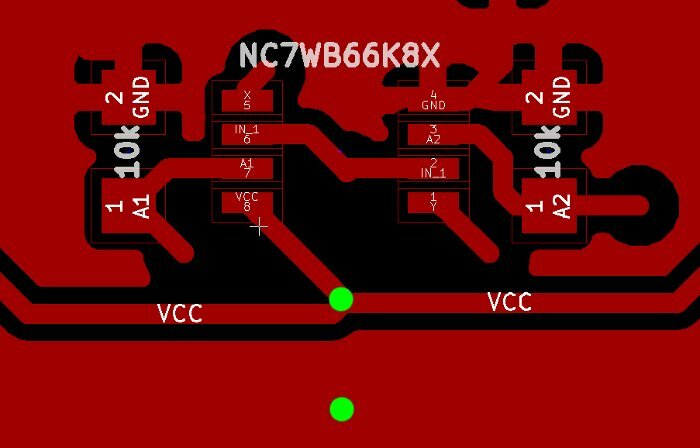 This means we can scrape a part of the copper plane and solder on a capacitor this way (see green points). This is obviously not exactly nice and we will fix this with the production of new Joystick Bricklets. We did discuss all possible alternatives we could think of, but the only other possibility would be to throw away all Joystick Bricklets we have here and add a delay of 1.5 month (until the new Joystick Bricklets arrive). 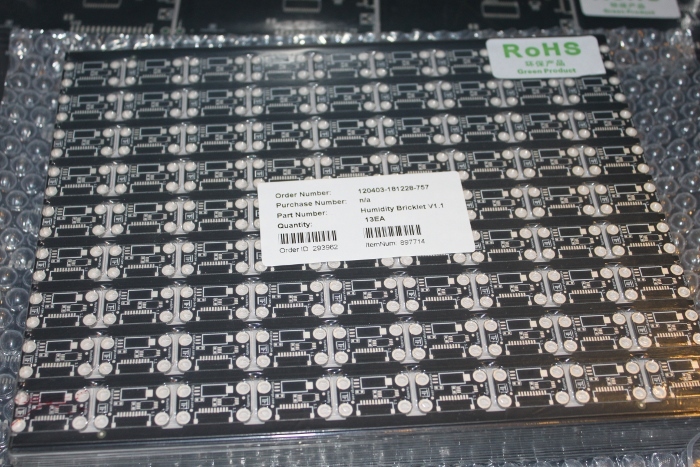 We will try to ship all open orderes with Joystick Bricklets today, but there are probably too many and some will only go out tomorrow. Appologies for the problems and the delays! Unfortunately all orders that include a Joystick Bricklet will have to be delayed for 2-3 days. The Joystick on the Joystick Bricklet consists of two potentiometers (for the X- and Y-axis). 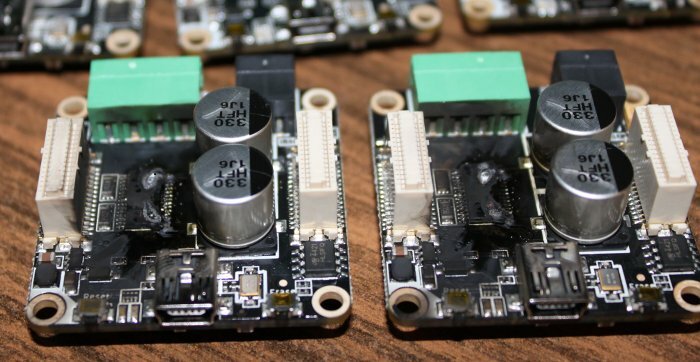 To read out two potis you need two analog-to-digital converters. Since there is only one analog-to-digital pin on a Bricklet port we needed some trick to get it working. For that we added an analog switch (NC7WB66K8X), it allows to demultiplex the two potentiometers. Recently our circuit board assembler finished the first reel of the NC7WB66K8X. The second reel was newly purchased and it contained the NC7WB66K8X with a newer date code. Unfortunately we found out that Fairchild changed the chip design on the new version of the NC7WB66K8X and it now produces a short circuit if a voltage is applied to the chip before ground. If you look in a USB connector, you will see that there are some pins that stick out further than others. These pins are the ground pins. Good thinking by the guy that designed the USB connector! It becomes a problem if you connect a Bricklet to an already running Brick. Depending on which site of the Bricklet connector reaches the pins of the Brick first, the NC7WB66K8X makes a short circuit or not. Officially we don’t support hotplug for the Bricklets, but we need it to flash them for the first time and it is just not acceptable that such a small mistake can make a short circuit and possibly destroy a whole stack! The good news: We did recognize the problem early and none of the broken Joystick Bricklets were shipped. Also we have found a supplier in China that can supply us with big amounts of the NC7WB66K8X with the old date code! The bad news: We ran out of Joystick Bricklets with the old analog switch on Friday and the new ones from China did not arrive yet. If your order contains a Joystick Bricklet and it is not shipped yet, your order will be delayed for 2-3 more days until we exchanged the faulty chips.